The purpose of this site is to provide the documentation of the genealogy of the descendants of Thomas Lincoln, the husbandman, one of the early settlers from England to America. This site is divided up into sections which can be accessed by clicking on one of the tabs above: "Home", Genealogies", "Name Search", "Y-DNA", "Sources", and "Contact". The easiest way to find a descendant is to click on the "Name Search" tab above, scroll down to find the person's name, and then click on it. This will display information about the person in the "Genealogies" section, including a mini-biography, and give the sources for such information. It will also display a list of that person's paternal history starting from Thomas Lincoln, the husbandman. By clicking on any of the names in the paternal history list, you can jump immediately to that person's genealogy web page. By clicking on any child's name listed in boldface, you can jump immediately to that child's genealogy page. Summary charts of all the known descendants are displayed at the opening page of the "Genealogies" section. Y-DNA evidence linking all the descdants is discussed in the "Y-DNA" section, and a compilation of all the sources used to build this site is listed in the "Sources" section. There are numerous current living descendants of this Thomas Lincoln spread throughout the United States, of which the author of this web site is one. As a courtesy, unless granted permission, only the names of young adult living descendants is published, not their birth dates, and the children of the young adult living descendants is not published. Names and dates of older living descendants (generally, above age 75) is published. From 1630 to 1640, there was a great migration of English settlers to Massachusetts, primarily Puritans motivated to seek freedom to practice their religeon. When they came to America, they generally landed in Boston harbor, and the first of these was the famous Plymouth Colony in 1620. 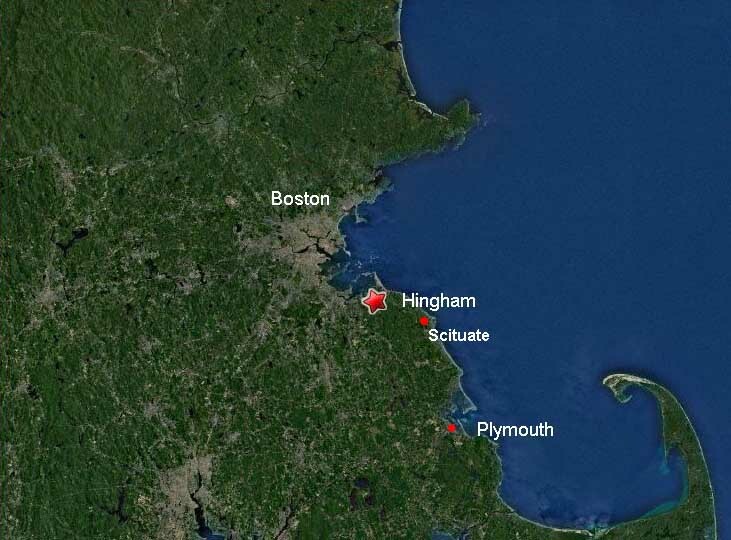 Future settlers landed north of Plymouth, closer to present day Boston, and Hingham was one such town that received many settlers. Daniel (known as "Sergeant" and "boatman"). A husbandman was a free tenent farmer. Two of these eight males had no offspring - Daniel, the husbandman, and his brother Thomas, the weaver (and both were brothers to Samuel, the weaver, who was the ancestor to President Abraham Lincoln). The general belief, however, among those who are most familiar with the history of the Lincolns of Massachusetts is, that they first settled at Hingham, on the South Shore of Massachusetts Bay, and that all the Lincolns of this country are their descendants. 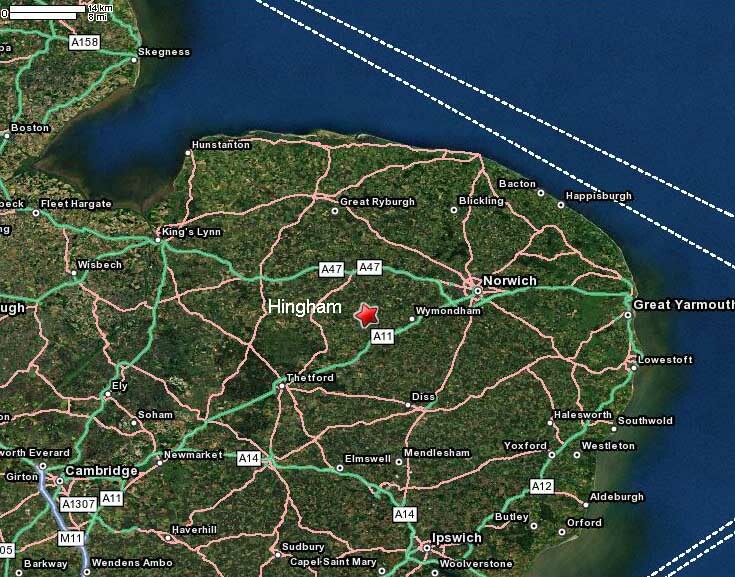 Whenever any particular family even in a remote part of the country has been traced to the place of its settlement, it has been found to have been at Hingham; and when it could not be traced to that spot, it could not be to any other. 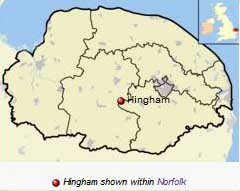 It may be remarked, also, that in those cases where the chain of evidence to connect any family with Hingham as the place of its origin has not been complete, tradition has almost invariably pointed in that direction. Thomas Lincoln, the husbandman, arrived in America in 1638 a few months shy of his 16th birthday, from Wymondham in Norfolk County, England, with his older brother, Stephen, their mother Joan, and Stephen's wife and son (Stephen) on the ship Diligent. His story is detailed in: Thomas Lincoln, the Husbandman.